It’s often performed as a village hall panto, with sub-standard sets and sneering villains peering from behind the curtain, but Casey Nicholaw’s spectacular Aladdin is a big-budget extravaganza that quite literally outshines every other West End production. Bob Crowley’s wondrous sets are so outrageously dazzling that audible gasps echoed throughout the auditorium. In particular, the golden Cave of Wonders provides the perfect backdrop for the all-important showstopper “Friend Like Me”, whilst the starry-lit magic carpet scene highlighted Jim Steinmeyer’s impressive flying carpet design, which is genuinely one of the best illusions on the West End. Fresh from Broadway, Trevor Dion Nicholas is the perfect genie. Full of flair, sass, wit and immense likeability, Nicholas has the audience cheering whenever he appears. In fact, the applause lasted so long for “Friend Like Me” that he had to cut it off to get the show moving. With a voice of jazz, blues and all things good, Nicholas is the real star of Aladdin and you spend most of the performance waiting for him to magically appear from the lamp (where Steinmeyer’s illusions impress once again). 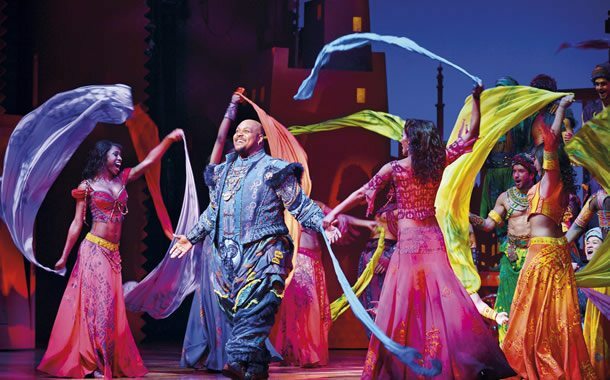 Dean John-Wilson and Jade Ewen as Aladdin and Princess Jasmine do what they can with very little, after all, Aladdin is the ultimate sappy Disney tale, but their voices blend beautifully, and “A Whole New World” is a delight to watch. Rachid Sabitri, Stephen Rahman-Hughes and Nathan Amzi provide a wonderful comic turn as Aladdin’s three mischievous friends, with “High Adventure” being another highlight of the evening. No expense has been spared with this production; Gregg Barnes’ costumes are a real treat, being both colourful and beautiful. It’s an amazing thing to see a production with so much money behind it, but most importantly, the whole cast look like they are having a ball on stage. Aladdin is definitely the most magical show on the West End right now, and you can only hope that it will receive the success it deserves.